The US Defense Budget has historically been under assault from anti-defense politicians. They would like nothing better than to see it reduced and the “savings” used for welfare programs. After all, the Defense budget is huge they say. Well, DoD’s budget HAS BEEN greatly reduced, starting with a ten-year $485B cut under SECDEF Gates, followed by sequestration reductions of nearly $500B projected over ten years. The left would suggest that this money is fair game for “reinvesting”. A stark and depressing fact is that the very welfare programs the left so loves to champion have given us our massive national debt. Each year the interest that we, the tax payers, must fork over to cover the interest on that debt grows. Using OMB data (primarily Table 3.2) , the below chart shows a comparison between that interest vs US Defense Budget projections. 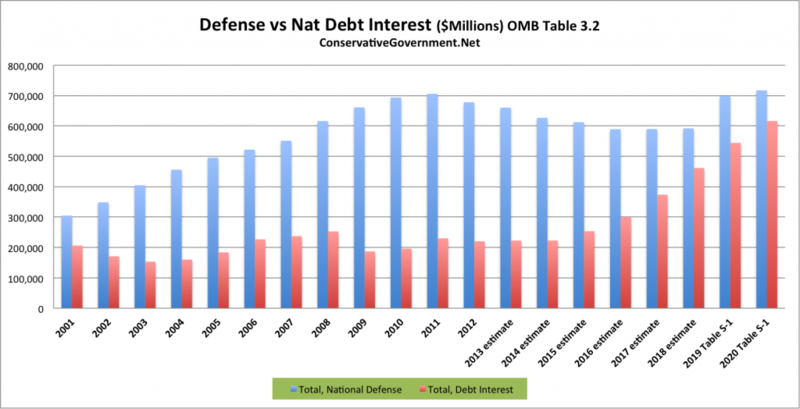 Annual interest is projected to catch the Defense budget around 2020, assuming that there aren’t additional defense cuts, increases in historically low interest rates, or additional runaway spending. Given recent history, it’s a good bet that both will happen.